Village View Post: On This Date: June 12, 1964 Nelson Mandela Sentenced To Life in Prison. On This Date: June 12, 1964 Nelson Mandela Sentenced To Life in Prison. 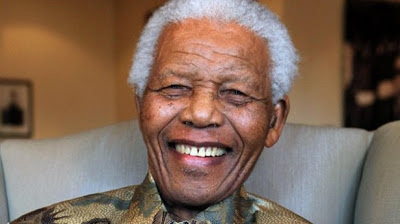 Today, June 12, 2013 the eyes of the world are on South Africa as Nelson Mandela remains hospatilized in serious, but stable condition with a lung infection. On this day, June 12, 1963 Nelson Mandela was sentenced to life in prison. He subsequently spent 27 years behind bars making him one the most recognized political prisoners in the world. Mandela was released from prison in 1990, with all his earthly possessions which included 22 boxes, a cardboard hat, one giant birthday card and a surf board. Mandela rose to power after his release and became president of South Africa in 1994.